Housing Hall of Fame (Oh My!) #EQ2 #EverQuest2 – Nomadic Gamers, eh! 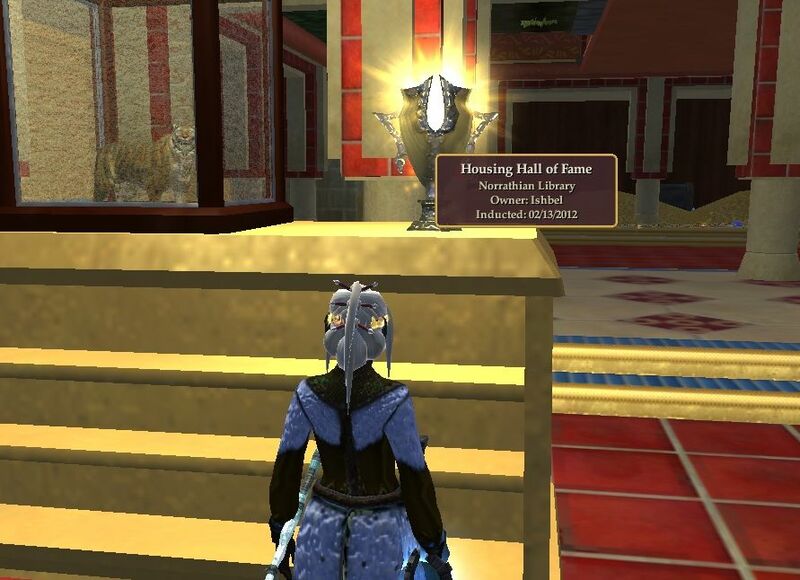 Yesterday on a bit of a whim I decided to log into EQ2 – and I found out that back in February my Norrathian Museum actually won an award for housing and made it into the hall of fame. I suppose that shows how often I log in, as I had no idea. The reward for this is an achievement, a title, and a neat trophy that you can place in your house (pictured above). I was tickled that I made it, I didn’t expect it but it did make me happy to know that people have been visiting the museum. The most noticeable thing about this player created house is the 500+ player-written books I have collected and placed, some of them years old now. A lot has changed in game since I last played. The level cap I believe is 92 instead of 90. There are other changes that I simply haven’t kept up to date with. It feels a bit sad, since this is a game I played as my ‘main’ game for many years. Despite the fact that I logged each of my characters in and had a poke around – I didn’t actually sit down and PLAY the game. I wasn’t interested in adventuring or crafting or doing anything more than poking around. I had no inclination to play. I just wanted to visit for a few minutes. Whether that’s because I’m enjoying myself in Vanguard these days, or because EQ2 has finally broken its long term hold on me, I’m not sure. Either way, it was still a nice surprise to log in and see.